Victorian Pink Roses Bouquet by Jennie Marie Schell - 8.000" x 6.000"
Victorian Pink Roses Bouquet framed print by Jennie Marie Schell. Bring your print to life with hundreds of different frame and mat combinations. Our framed prints are assembled, packaged, and shipped by our expert framing staff and delivered "ready to hang" with pre-attached hanging wire, mounting hooks, and nails. Lovely and so delicate. Very beautiful. Fantastic! I love the colors and softness. Beautiful, Jennie-----love the way you handled the softness on the edges----voted! Absolutely gorgeous and so very romantic. 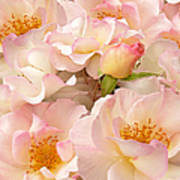 Soft light enhancement of old fashion pink, cream, and yellow Roses flower bouquet. 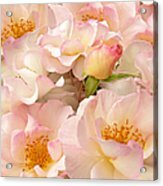 Wonderful floral art for your home or office decor. Copyright by Jennie Marie Schell. All Rights Reserved.